For those who haven’t seen the first Purge, it's about a future America where the new leaders devised a plan to remove crime. Instead, people wait to "cleanse" themselves. For twelve hours, one day out of the whole year, crime is legal. Everyone waits for this particular moment because they are free to do whatever. Of course the question is raised, what would YOU do if all crime is legal? Steal? Take drugs? Beat a person senseless? Even kill? If you watched the first movie in the series, it follows a family that goes through this “purge” and it gets crazy. 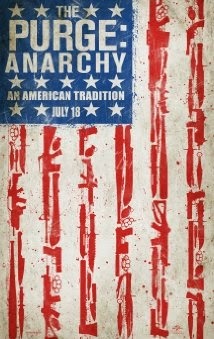 Let me tell you now that Anarchy shows a lot more purging and a lot more gruesome crimes. It starts with a community in Los Angeles. A few hours away from the commencement of the purge, people are preparing to participate or boarding up their houses for protection — if protection can be achieved. The usual participants buy massive machine guns and all sorts of weapons and those with lots of money can buy the best security systems. The story follows a couple of characters: a mother trying to support her daughter, a young couple whose car breaks down and a sergeant looking for revenge. The only one purging is the sergeant, but with a twist. He meets up with the mother and daughter and the couple and it's up to him to keep them safe. At the same time, he still hopes to achieve his goal before the end of the night. The movie shows a totally vengeful America. You can’t trust your friends, or even family because, if you piss someone off, who knows if they’ll come after you and take you out during those 12 hours of free reign of no laws.